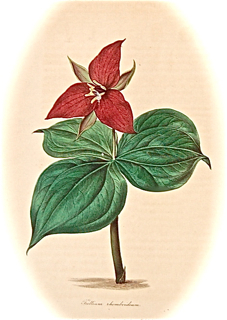 Trillium's inventory of Antiquarian Books comprises several collections-- Country Life, Natural History, Canadiana, Literature, Illustrated Books, Images, Maps, and Curiosities. Our inventory always will be of modest size, but I hope it always will be worthy of your interest. One way or another, antiquarian books on country life address the need 'to be versed in country things'. You will find, for example, English farming books from the 18th century, books for anglers, whether by fly or worm, dating almost back to Walton, gardening and horticulture books, studies of apiculture and classic landscape design. Almost any part of the world will do, so long as there are flowers or fish or bees. Because I am someone who has tried his hand at farming, you may find a special antiquarian book on barns or cattle raising or you may find early seed catalogues or herbals with cures and potions which sometimes worked. Almost any part of the world will do, too, when it comes to early studies of Natural History. My earliest interest is ornithology, birds and bird books, and so, while you are unlikely to find an elephant folio Audubon in the collection, Alexander Wilson's bird books likely will be on offer or Bewick's or Morris's. Look for early geographies and look for botanical studies of native North American and European plants published on either side of the eighteenth- nineteenth century divide. I do not shrink from some Latin here. Much of our early scientific, as distinct from mythic, zoology (botany, too) originated with the observations of travelers and explorers (that, after all, is where Darwin came in), and therefore you will find journals and memoirs of those who journeyed in the name of science or merely out of curiosity to the Arctic, the Yucatan, or the outskirts of Philadelphia. Our Canadiana cuts across all the other categories and some others to boot. It certainly includes interesting editions of the work of early settlers in this part of English Canada-- the Strickland sisters, Susannah Moodie and Catharine Parr Traill, and later arrivals such as Robertson Davies; but you will find as well works on the Canadian arctic and the commentaries of British visitors or wandering Americans, together perhaps with the only Golden Cockerel publication of a Canadian title. Our Literature Collection casts a wide net and catches sermons, novels, essays, poems, letters, and satiric sketches. You may find a 17th century translation of The Consolation of Philosophy (one of the first books I recall selling) or a copy of The Catcher in the Rye in just the right dust wrapper. As someone who started out as a middle American and not an Upper Canadian, I am always on the lookout for an early Mark Twain or something unusual by the other kid from Newark, Stephen Crane. If you examine under magnification a Bewick wood-engraving (perhaps a tail-piece at a chapter end), you will begin to understand something about the relation of image and text. Sometimes, though, there is little or no text, and the collected images are the main feature, as with many flower books and art collections. Lithographs, wood-engravings, wood-cuts, steel and copperplate engravings, freed from their bindings by the forces of entropy are sometimes remarkable in their own right. Our collection of maps begins at about 1850 and, with a few exceptions, runs backward to some early published versions of what parts of the earth looked like and includes illustrated atlases. I find an illustrated technical monograph on cockroaches or a treatise on water dowsing by a German count hard to resist and therefore have decided not to. Look for intriguing oddities such as these in this collection-- a commercial fisher would call them the by-catch and pitch them into the sea from whence they came, but these are too good to throw back. Trillium Antiquarian Books is owned by William Van Nest. Member, Independent Online Booksellers' Association (IOBA) since 2002. Book fair exhibitor at Ottawa, Toronto, Maine, Vermont and Michigan variously since 1998. Professor (ret. ), Interdisciplinary Studies, Sir Sandford Fleming College, Peterborough, Ontario, Canada. A.B., Kenyon College; graduate studies, Rutgers University. Publications include Connections: Effective Reading and Writing, Prentice-Hall; writer, online courses in report writing and business communication. But I refrain from pursuing this minute description, which goes on to describe the warriors of Bloemen-dael, and Weehawk, and Hoboken, and sundry other places, well known in history and song—for now do the notes of martial music alarm the people of New Amsterdam, sounding afar from beyond the walls of the city. But this alarm was in a little while relieved; for, lo! from the midst of a vast cloud of dust, they recognized the brimstone-colored breeches and splendid silver leg of Peter Stuyvesant, glaring in the sunbeams; and beheld him approaching at the head of a formidable army, which he had mustered along the banks of the Hudson. And here the excellent but anonymous writer of the Stuyvesant manuscript breaks out into a brave and glorious description of the forces, as they defiled through the principal gate of the city, that stood by the head of Wall Street. First of all came the Van Brummels, who inhabit the pleasant borders of the Bronx: these were short fat men, wearing exceeding large trunk-breeches, and were renowned for feats of the trencher; they were the first inventors of suppawn, or mush and milk. Close in their rear marched the Van Vlotens, or Kaats-kill, horrible quavers of new cider, and arrant braggarts in their liquor. After them came the Van Pelts of Groodt Esopus, dexterous horsemen, mounted upon goodly switch-tailed steeds of the Esopus breed; these were mighty hunters of minks and musk-rats, whence came the word Peltry. Then the Van Nests of Kinderhoeck, valiant robbers of birds' nests, as their name denotes; to these, if report may be believed, are we indebted for the invention of slap-jacks, or buckwheat cakes. Then the Van Higginbottoms, of Wapping's Creek; these came armed with ferrules and birchen rods, being a race of schoolmasters, who first discovered the marvelous sympathy between the seat of honor and the seat of intellect.